Muscle Milk® Collegiate Ready-to-Drink Nutritional Shakes are ideal for post-workout recovery or as a healthy nutritional beverage anytime during the day. Superior taste and the right nutrients in a convenient package give athletes the nutrition their bodies crave until they can reach that next meal. A Balanced and Complete Formula: Muscle Milk Collegiate is an excellent source of protein, carbohydrates and fats designed to help you prevent overtraining and aid in reducing injury from nutrient deficiency. Multi-Source Protein Blend: Comprised of Caseinate, Milk Protein Isolate, and Whey. 100% Complex Carbohydrate Source: helps keep muscle glycogen at peak levels to extend performance and endurance. Maintaining muscle glycogen assisting in the production of muscle ATP to fuel longer, harder workouts. It helps stop muscle breakdown after workouts, and encourages favorable nitrogen retention. Trans Fat Free Lipid Complex: Muscle Milk Collegiate contains predigested, trans-fat free Medium-Chain Triglycerides (MCT's) that are more likely metabolized for muscle energy and heat than stored as fat. Long-chain polyunsaturated and monounsaturated fatty acids from Sunflower/Safflower and Canola Oils are also less likely to be stored as fat. These lipids are additionally functional, since they enhance mineral retention. Compliance: Muscle Milk Collegiate is suitable for collegiate athletics and is permissible under NCAA® Bylaw 16.5.2.2 for nutritional supplements. *NCAA® is a registered trademark of National Collegiate Athletic Association. 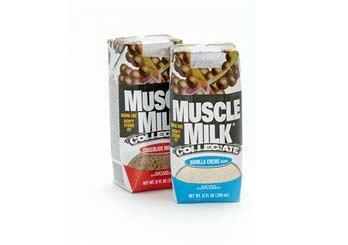 Buy Muscle Milk Collegiate RTD Now!